Centuries before workhouses were established, the care of the country’s poor and infirm had fallen to monasteries and nunneries and citizens’ charitable legacies. But in 1538, with Henry VIII’s Dissolution of those religious houses, care of the poor and sick became the responsibility of those who had bought up church estates. Later, poor relief was the business of parish churchwardens, giving way in the early nineteenth century to large Union Workhouses and lastly our modern welfare state. Prior to the commissioning of the new Rochford Union Workhouse in 1835 the poor could be housed in the Alms Houses built by Lord Robert Rich, Earl of Warwick, in Rochford itself and in two workhouses in Rayleigh. One was sited at Bedloes, opposite Rawreth Hall, while the other stood just outside the Churchyard gates in the High Street and, according to documentary evidence, was repaired in 1772. Parish workhouses had come into existence to stop the widespread abuse of what was termed ‘outdoor relief’ and substitute it for ‘indoor relief’, whereby the distressed poor became lodgers under one roof performing tasks for their keep. In 1796-8 John Person of Brentwood, weaver, was ‘Governor’ of Rayleigh workhouse and agreed with churchwardens John Alridge and Richard Goodman ‘to find the paupers of the parish of Rayleigh who shall be in the workhouse with all necessary Meat, Drink and Clothing,’ and was allowed and ‘compelled to keep at work’ those fit enough to work for him in his woollen manufacturing business. He was allowed 3 shillings a week for each pauper, three cauldrons of coal per year and £2 to cover the cost of each pauper woman who delivered her child whilst an inmate. Updated agreements included 5 shillings for each death in the workhouse and a duty to compel those inmates who were able to attend divine service on Sundays. In 1812 Governor Spurge was given 7 shillings per week for each of the two ‘lunatics’ on the premises. Workhouses were allowed to make agreements with local people to help with the upkeep of the destitute and thus farm out poor children. Between the years 1822-29 Apprentice Laws made it possible for several young lads of Rayleigh to be found trades. The four blacksmiths’ forges in Rayleigh at the time took four boys while others found employment with local cordwainers (shoemakers), carpenters, tailors, brushmakers and some with fishermen in Leigh. Some youngsters were boarded out to people in the town for a sum of one shilling and sixpence a week paid by the workhouse. Those who took them in were obliged to keep their charges in ‘meat, drink, lodging, washing and cloathing (sic)’. 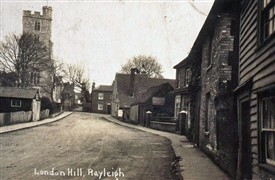 At the end of each year all clothing was to be recognized as the boy or girl’s own property and if a doctor ever had to be called, it was agreed the parishioners of Rayleigh would pay the expenses. There seems to be truth in the old adage that ‘there is nothing new under the sun’. Just as we ‘outsource’ services today, in the past it was also popular. Take the shaving of paupers. In Rayleigh this was undertaken by contract and a document of 1822 details the following; ‘On March 25, it is agreed by the churchwardens and overseers with the principle inhabitants this day assembled to allow Mr Charles Clark Noone two pounds from this time till Lady day next to shave and cut hair for the paupers in the Workhouse’. Records also show this erstwhile barber was also a parish constable. He is buried in Rayleigh churchyard on the south side of the tower. This page was added by Karen Bowman on 27/08/2011.